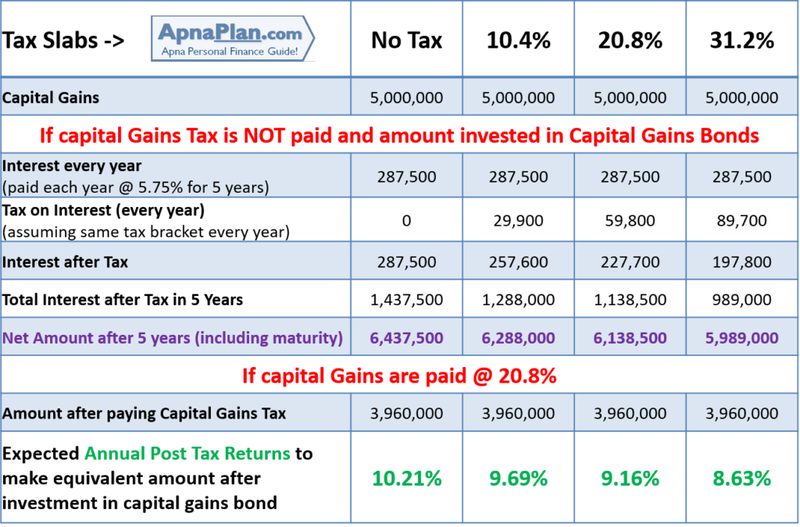 Should you Invest in Capital Gains Bond to Save Taxes? We love to Save taxes and one of the ways to save on Long term Capital Gains Tax on Real Estate is to invest in Capital Gains Tax Saving Bonds from NHAI, REC, IRFC or PFC. Capital Gain Bonds – Should You Invest? The question now is should we invest in Capital Gains Bond to save tax or pay capital gains tax and invest as per our convenience for higher returns? As you can see with people in highest tax bracket of 30%, need to make at least 8.63% returns after tax which may be achievable by investing in right investments. This number would be higher for people in lower tax brackets! I think investing in capital gains bond is totally your choice – if you think you can generate higher return than that mentioned in the last row of our calculation, then pay your capital gains tax and invest accordingly. Also Read: How are your Investments Taxed? 3 Ways Your Parents can help you Save Taxes? How your wife can help you save taxes? Yes you can do either. I am new to investing and I am daunted by where to invest. This seems like a good option but the following article also helped me a bit what do you think about it? The date this article was posted is ‘Aug 18, 2018’, but some of the comments here are from year 2017. How’s that possible? Reason for my doubtis, is the information given in the article valid in FY 2018? My specific question is. Do all 4 (NHAI, REC, IRFC and PFC) bonds are eligible for exemption from Capital Gains in FY 2018? Many websites, including that of Income Tax Dept specifically mention only NHAI & REC by name (it also has words ‘or any other bond’). HDFC Securities site says NHAI, REC & PFC are valid (no mention of IRFC). There does not seem unanimity. The article was first written in 2017 but updated in Aug 2018 and hence the date and comments. IRFC was included in the list 2 years back. Many websites may not have updated. However if you are in doubt go with NHAI/REC as the interest rate and all terms and conditions are exactly same across all companies. suppose i have earned 50Lac as capital gain after selling my property. To save long term capital gain tax , i invested my 50lac in these capital gains BOND. So what will happen to my 50Lac after 5 years of maturity. Do i still have to pay long term capital gain tax on on 50lac after 5 years. Or tax on my gains are exempted now?? your capital gains are exempted after 5 years of capital bonds investment. I must appreciate the detailed calculations that you’ve made. However, I see a flaw in the tax calculation for Interest on REC bonds. These Bonds have interest payment at every 6 months (am not sure if there is a yearly or a cumulative interest payment option). Nonetheless, interest has to be taxed in the year the interest has accrued and not in the final year of interest receipt. Similar to FD interest, wherein the bank deducts TDS on the interest accrued. Hence, in all the above scenarios interest component would be the same i.e. 50 lac *5.25% = 2,62,500 INR. And tax on interest would then be calculated for each tax bracket i.e. 27038 INR ,54,075 INR & 81,113 INR respectively for each of the above tax brackets. The interest is payable annually on June 30 and yes its taxed every year. I have changed the calculation to incorporate 5 years holding period and increased interest of 5.75%. Dear Amit, Thanks for good info. I want to purchase 50K bonds from REC. Where should I purchase? Whom should I contact? You can buy REC Capital Gain Bonds from various banks & brokers. This is the list as suggested by REC. I read Mr. Kumar’s article at his website Value Research. The very first thing I noticed was a lack of maths to prove his point, combined with the fact that he mentioned the ROI as 6%. I said as much in a comment on his article. So I am glad you actually used mathematics to prove your point. When it comes to money, I am surprised that in this day and age, experts can still get away with publishing sweeping statements with no math to back up their claim. I also read this article in the newspaper and was surprised to note that the article in the newspaper was not well researched. They even mentioned that Interest on Cap Gain Bonds is 6% whereas it is 5.25%. Anyways, you have now clarified everything and also mentioned that in case the taxpayer pays Capital Gains tax, he should earn a minimum of 12% return to be at par.